A day after the Trump administration formally recognized Venezuelan opposition leader Juan Guaido as the country’s’s interim president, triggering a standoff with President Nicolas Maduro over the status of U.S. diplomats in the country, Venezuelans are apprehensive about what comes next. Andreina Fermin, 37, has lived in Caracas for 12 years, but she has never seen a Thursday morning in the usually-crowded capital look like this. Instead of people rushing to work, traffic jams and bakery lines forming at 6 a.m., “the city is empty, the streets are empty,” she told ABC News. Those who want to see Maduro leave office are cheering Guaido’s decision to swear himself in as interim president, a move supported by the U.S., Canada, Brazil, and a handful of other countries. But others are calling the National Assembly president’s move a coup d’etat. Both sides fear that the political conflict could spiral into widespread violence and perhaps even a civil war. This crisis has been years in the making, but the escalation of tensions — and the U.S. mention of a military intervention — could make things much worse, experts say. Here is what you need to know about the roots of the crisis, the role the U.S. has played, and what could happen next. 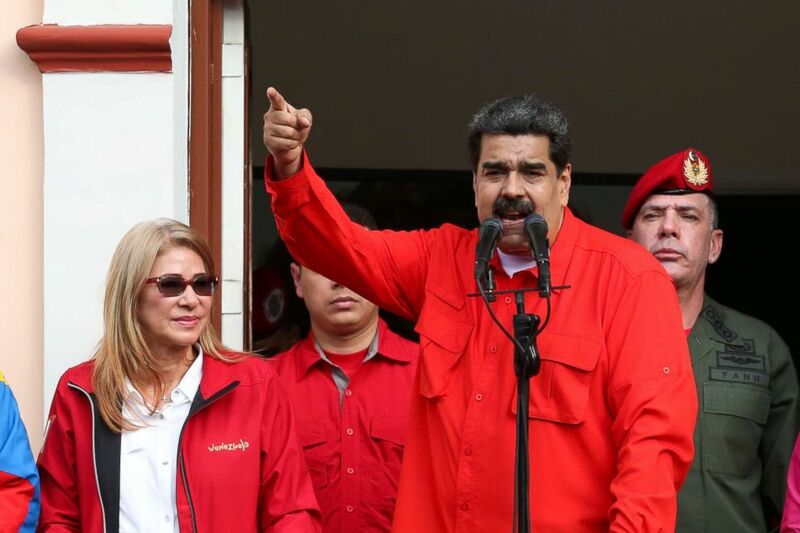 Maduro, 56, was sworn in for a second six-year term as Venezuela’s president on Jan. 10, 2019. He previously served as vice president to Hugo Chavez, the socialist leader who started the country’s “Bolivarian Revolution.” After Chavez died of cancer in 2013, Maduro took over and was then elected to his first six-year term. He was re-elected in May 2018 in a vote that was boycotted by much of the opposition and in which popular opposition candidates were barred from running. The election’s legitimacy was criticized by institutions inside and outside of the country, including the U.S. government, something the U.S. has not done recently in other contested elections in the region. “There is a tremendous irony in the fact that the U.S. government won’t recognize President Maduro and the results of the election that took place last May when they were very willing to recognize extremely flawed elections that took place in Honduras in late 2017,” Alexander Main, the director of international policy at the Center for Economic Policy and Research, told ABC News. Since his re-election, Maduro has faced even more opposition from Venezuelans who are tired of the country’s economic crisis, which has been going on for years, and oppose his jailing of opposition figures and move to elect delegates to a government body that would help rewrite the country’s constitution. On the day of his inauguration earlier this month, the Organization of American States, an international body made up of countries from North America, Latin America and the Caribbean, voted not to recognize the legitimacy of his new presidential term in a resolution that was presented by delegations from Colombia, Argentina, Brazil, Chile, Costa Rica, the U.S., Paraguay and Peru, the Associated Press reported. Venezuela’s National Assembly head Juan Guaido declares himself the country’s “acting president” during a mass opposition rally against leader Nicolas Maduro in Caracas, Jan. 23, 2019. 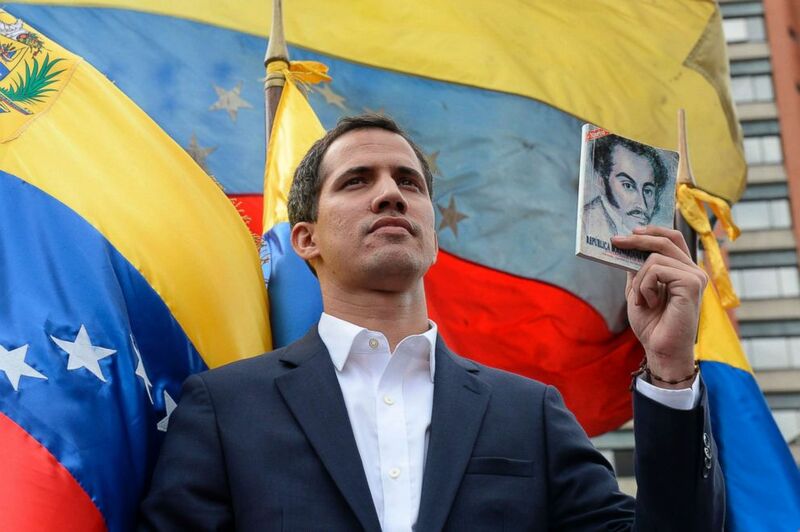 At the time of Maduro’s inauguration, Guaido, 35, the president of the country’s National Assembly and a member of the opposition, accused Maduro of “usurping the presidency,” the AP reported. On Wednesday afternoon, Guaido declared himself Venezuela’s interim president as thousands of supporters cheered him on during a rally in Caracas. Guaido claims he has the constitutional authority to act as interim president; others disagree. The U.S., Canada, Colombia, Paraguay and Brazil quickly recognized Guaido as the interim president of Venezuela. But others in the region called for calm and a political dialogue to avoid violence. Geoff Ramsey, assistant director for Venezuela for the Washington Office on Latin America, a think tank, said the U.S. decision to recognize Guaido is partly an attempt to get Venezuelan armed forces to abandon Maduro. Main said this is just the latest in a series of such pushes. Venezuela’s armed forces reiterated their allegiance to Maduro Thursday, with Defense Secretary Vladimir Padrino Lopez calling Guiado’s claim to power “reproachable,” and “against the state of law in this country,” adding that it was an attempted coup backed by the U.S.
As the battle for the armed forces’ loyalty continues, many on both sides fear that such a division — and the fact that some citizens also own guns — could result in a civil war. “From the very beginning, there has always been the fact that those who are going to suffer the brunt of consequences, whether it’s of the status quo or any attempt to change, are the poorest. And that’s always been the case, that’s always going to be the case,” Ciccariello-Maher said. Venezuela’s deep economic crisis is what, in many ways, has spurred the political crisis. Out-of-control inflation means that the prices of everyday goods have soared while the value of the country’s currency has plummeted. The economic crisis has been worsening for several years, propelled downward by falling oil prices, structural issues and mismanagement, experts say. 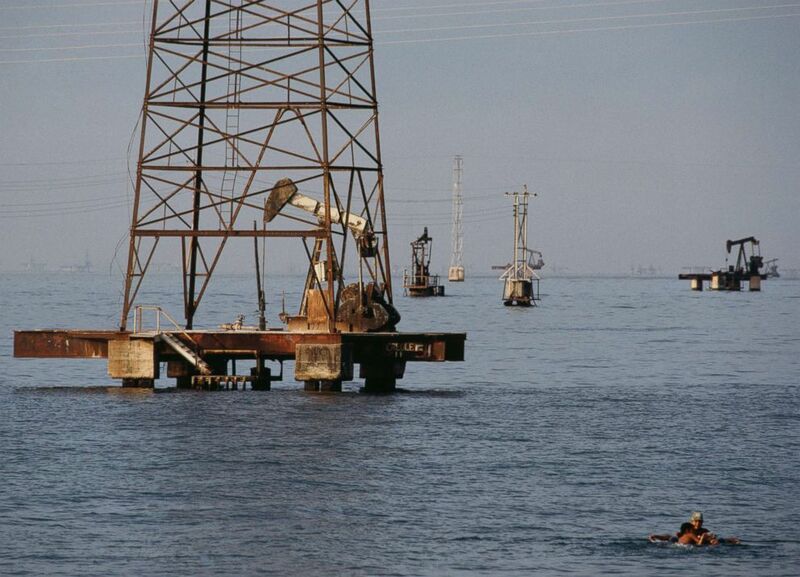 Oil platforms on Lake Maracaibo, Venezuela, June 2014. “The crisis has a lot of deep roots, it’s rooted in the structure of the Venezuelan economy, which have a lot to do with oil and the decline of the price of oil, but it also has to do with some level of mismanagement by the government and political opposition both domestically and abroad,” Ciccariello-Maher said. Venezuela has been an oil producing nation since 1914 and is currently a member of the Organization of Petroleum Exporting Countries (OPEC). According to OPEC, 95 percent of Venezuela’s export earnings come from oil. But for decades, the country’s oil wealth mostly benefited the country’s elite. Former Venezuelan President Hugo Chavez was elected in 1998, partly on the promise to use some of that oil money to help the country’s poor. Chavez used oil money to fund many of his infrastructure and housing projects, which saw vast improvements in the quality of life for some of the poorest Venezuelans. But in countries that export large amounts of oil or other natural resources, it’s not uncommon for other industries to be underdeveloped in what economists call the “Dutch Disease.” Oil is such a commodity in the global economy that some nations rely on it for nearly all their revenue, importing most of their other goods. Falling oil prices upset the balance in Venezuela. Currency devaluation then led the country to have less buying power for imports. Economic decisions by Maduro to continue subsidizing food and other goods, despite the government suffering major losses in oil revenue, also played a role in the deepening crisis. Many food and medicine products have been hard to find for the last couple of years. This, along with rising crime and skyrocketing inflation, has contributed to a decline in Maduro’s popularity. Venezuela’s President Nicolas Maduro attends a rally in support of his government and to commemorate the 61st anniversary of the end of the dictatorship of Marcos Perez Jimenez next to his wife Cilia Flores in Caracas, Venezuela, Jan. 23, 2019. The worsening economic situation has motivated some of Maduro’s supporters to want new leadership. In November, the total number of Venezuelans fleeing the country hit 3 million, according to the United Nations Refugee Agency and the United Nations Migration Agency. Venezuela’s government has had a frosty relationship with the U.S. for years, but tensions between the Trump administration and Maduro have escalated to a new level. In the Oval Office on Wednesday, Trump warned that his administration had “all options” on the table on how to further respond to the situation. Maduro responded by breaking relations with the U.S. and ordering all American diplomats to leave the country within 72 hours. But Secretary of State Mike Pompeo said Thursday that would not happen. The tensions between Maduro and the Trump administration could have dangerous consequences, Ciccariello-Maher said. “The danger of this standoff is the next step would be for the Venezuelan government to detain U.S. diplomatic officials who are not welcome in the country, but maybe this is what Trump wants. Maybe he is looking for an excuse to take a more aggressive action,” Ciccariello-Maher said. But Ramsey said he doesn’t believe the U.S. wants to use a military option. “I think the people of the National Security Council and in Department of State fully understand that military intervention in Venezuela would be a disaster. It would be a logistical nightmare and a complete bloodbath, most likely,” Ramsey said. 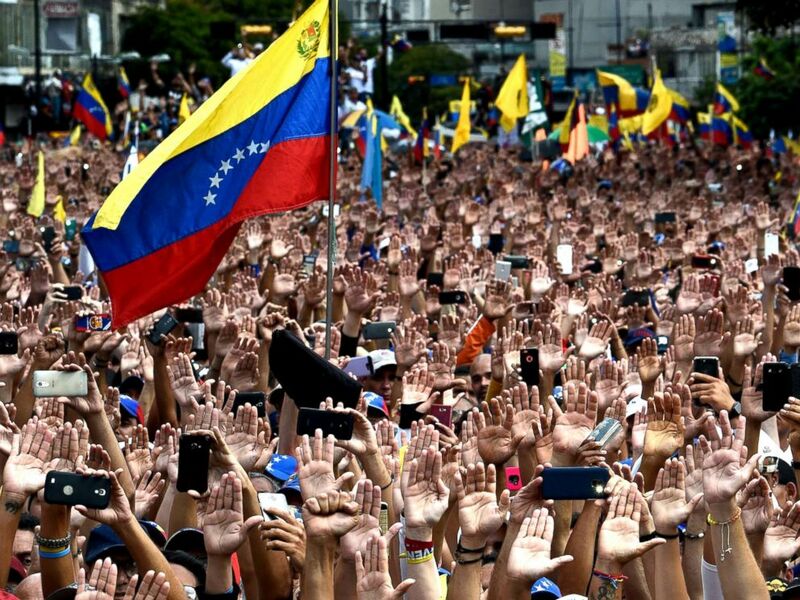 People raise their hands during a mass opposition rally against President Nicolas Maduro in in Caracas, Venezuela, Jan. 23, 2019. Many on both sides are worried that the situation in Venezuela could deteriorate into a civil war or a return to military rule, which the country endured between 1948 and 1958, and during which many suffered incarceration, torture and murder. Main said the dispute over U.S. diplomats has made both sides harden their stances and decreased the possibility of peaceful dialogue. Some countries — including Spain and Vatican City — have offered in the past to serve as mediators between Maduro and the opposition. But whether both sides can find their way to the negotiating table remains to be seen, and experts say there are no quick fixes. “Dialogue, while necessary, is not going to solve the economic situation. So while you need a ratcheting down of political tensions, you also need a more decisive change on the economic front,” Ciccariello-Maher said. A grim economic reality continues on the streets of Caracas even as the country’s political future remains uncertain. ABC News’ Victoria Moll-Ramirez, Conor Finnegan and Esther Castillejo contributed to this report.